Editor's Note: The lead writer was originally identified as Marvel writer Christos Gage. While Gage consulted in the writing, Insomniac Games' Jon Paquette was the lead writer. This has been changed. After over 50 years, the degree of difficulty for coming up with a memorable Spider-Man story has gone up considerably. So imagine how good the story for Marvel's Spider-Man must be if it's not only one of the best Spider-Man stories to come along in years, but also one of the single best video game narratives in 2018. For this to happen, it takes more than a story about a friendly neighborhood Spider-Man. Of course, that's here, too. Spider-Man has a full rogues gallery in place, starting with the intro mission that sees him take on Wilson Fisk, The Kingpin. A handful of his classic enemies, like Electro and Vulture, are here, as are newer foes taken from the Dan Slott era of Spider-Man comics from the last decade. Spidey has to balance taking down these bad guys, while also working in the middle of Norman Osborn's mayoral regime. No, for this to be a truly impactful Spider-Man tale, it also must be a good Peter Parker story. 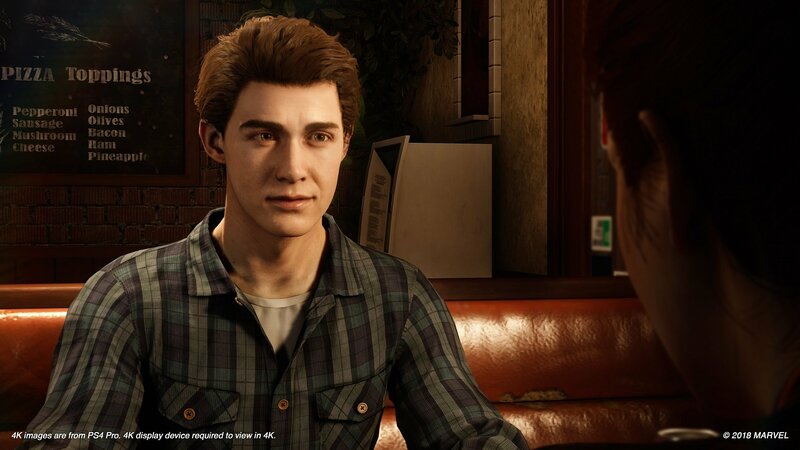 And that lead writer Jon Paquette and his team are able to weave together a strong Peter Parker story in the realm of a video game is an amazing feat. For one thing, this isn't the story of a rookie teenage superhero, as has been the trend in pop culture. This is a veteran Spider-Man, one with real world problems. He's dealing with money troubles, working with his ex-girlfriend who's fully aware of his double life, and struggling to achieve his real dreams that don't involve web-slinging. Peter Parker is a fully fleshed-out human and while past Spider-Man games have made players feel like the spider, Marvel's Spider-Man does an incredible job of making player relate to the man. The key to saving New York isn't just in slinging webs and flying across Manhattan in a New York minute. It ultimately comes down to being the best Peter Parker: Peter Parker the scientist, Peter Parker the empathetic figure who helps his aunt run the FEAST shelter, and Peter Parker the loyal friend who sees the best in everyone. For making players revel in being New York's finest superhero, making players laugh with his interaction with the police and everyone else he comes across, and for also making people relate to the man behind the mask, Marvel's Spider-Man stands out as the best gaming narrative of 2018.